From the rustic charm of the outback to the dream-like landscape of the Whitsundays, Queensland has more than most on offer when it comes to stunning travel destinations. We know it, the world knows it, but sometimes you just want to jump into the car (or head to the airport) and go somewhere you’ve never heard of before. Luckily, we’ve put together this list of the most stunning spots you had no idea called our humble sunshine state home. All you have to do is gather the squad and decide where you want to go. Ah, so many choices, so little time. 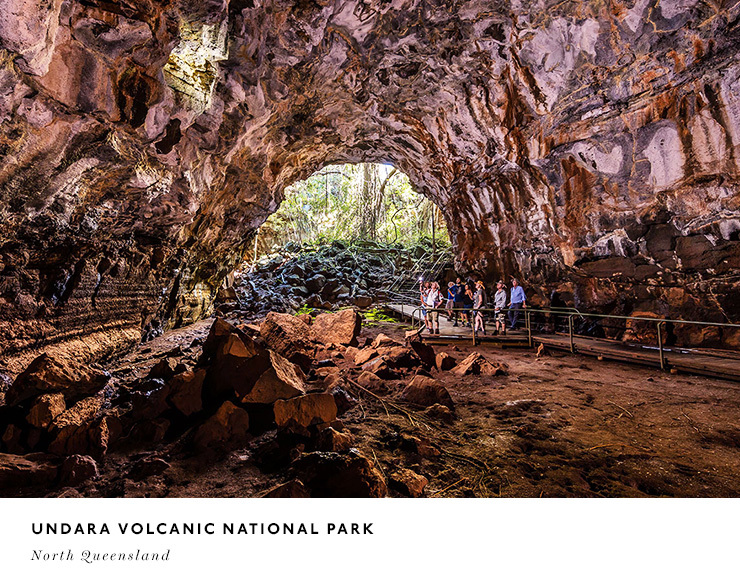 Undara Volcanic National Park, accessible from either Townsville or Cairns, is home to the remains of the Earth’s longest flow of lava originating from a single volcano. The lava tubes are the largest and longest on the planet, and they make for some pretty spectacular scenery. We’re talking soaring archways, a landscape that harks back to prehistoric times and walking tracks that will make your inner Indiana Jones jump for joy. If you need more convincing, the word Undara is indigenous in origin and literally means ‘a long way’ so you know there’ll be plenty to explore. If exploring lava tubes doesn’t sound like your thing, you could always hop on over to Paronella Park, a heritage-listed, Spanish-inspired garden that you’ve probably never seen anything like before. Located 120 kilometres south of Cairns, Paronella Park boasts a natural waterfall and lake, known as Mena Creek Falls, a Spanish-inspired castle complete with water fountains and is often the spot of many a wedding for love-struck couples from the surrounding area. Built in the 1930’s by Jose Paronella – a Spanish pastry-chef who immigrated to Australia with his fiancée Margarita – Paronella Park is one of the most successful attractions in North Queensland for a very good reason. If you’re interested in the true outback experience, look no further than Starlight’s Lookout, located only a short 55 kilometre trek north-west of Longreach along an unsealed road. This outcropping provides panoramic views over Longreach and the rolling plains of the surrounding area. Plus, a photo atop the lookout makes for a pretty great Facebook profile pic. What are you waiting for? With its stunning greenery and killer views, Carnarvon Gorge is a must see for any Queensland traveller. The park’s features include a soaring natural amphitheatre, the Insta-tastic moss garden and the truly awe-inspiring cathedral cave. Seriously, there’s nothing like a romp around Carnarvon to remind you about how dang beautiful nature is. Just remember to pack your hiking shoes. 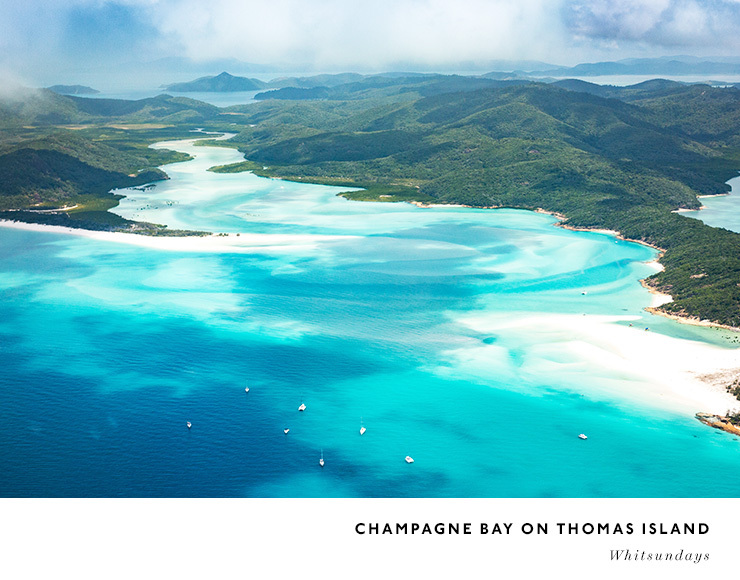 If the tourist-heavy Whitehaven Beach doesn’t do it for you, why not charter your own private cruise to the fancy AF Champagne Bay on Thomas Island. This idyllic, unspoiled beach earns its name from the millions of bubbles that rise to the surface when you wriggle your toes in the water – just like a glass of bubbly. It’s just like a natural spa bath and is the perfect place to kick back and relax with some wine and nibbles. Trust us, you’ll be feeling refreshed and ready to take on the world in no time. Long coveted as the prime surfing spot for water-inclined locals, Double Island Point is one of the Sunshine Coast’s best kept secrets. 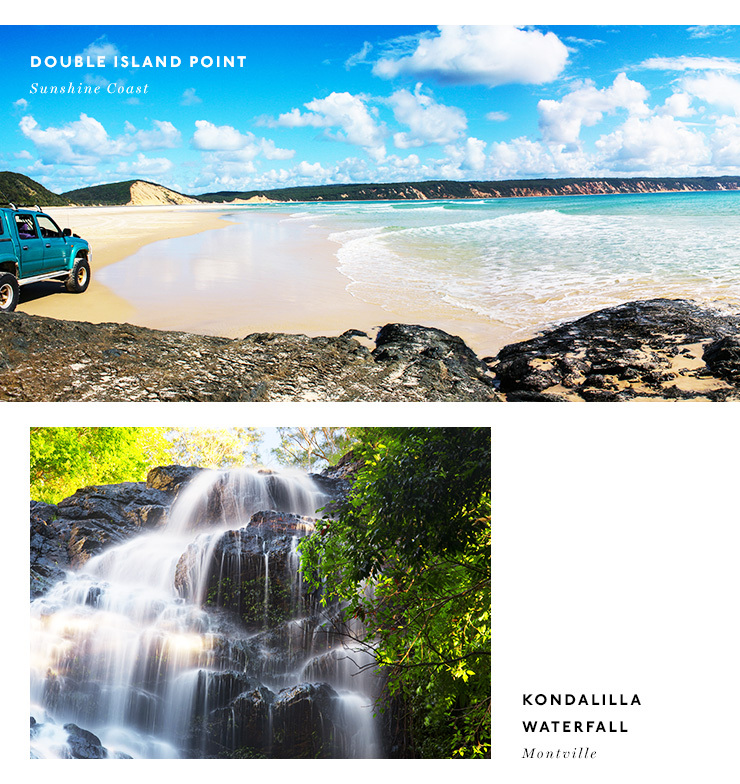 With its stunning turquoise water, its rating as one of the top 10 dive spots in Australia and killer scuba scene, Double Island Point is the perfect destination for a weekend away with the squad. The point is located just south of Rainbow Beach, where you can experience some fine dining on the way to paradise. Sign us up! Montville, located in the Sunshine Coast Hinterland, has it all: quaint shops and cafes, glorious natural beauty and a thriving creative scene. Originally settled in 1887, this adorable town is now home to an impressive selection of art galleries, pottery studios, craft cottages and fashion boutiques, all centred on a leafy tree-lined street with great views of the spectacular hinterland. Don’t forget to stop and appreciate the European architecture. While Tamborine Mountain is no secret spot, the botanic gardens most definitely are. The highlights include a Japanese garden, a Thai Salah – complete with bamboo pagoda and goldfish – a rose garden, a wisteria walk draped with the gorgeous purple flowers and an orchid house that will please all your green-thumbed desires. It’s quiet, it’s cool and it’s definitely not on the radar for most of the tourists vising the area, making the botanic gardens the perfect getaway spot for a bit of rest and relaxation. Located on the eastern side of Coolangatta, Greenmount Beach is the local’s beach of choice and we can certainly guess why. Boasting clear blue waters, warm golden sand and relatively sheltered surf, which is ideal for those amongst us with little ones, Greenmount Beach is perfect in every way. Get up early and take a stroll across the waterfront before ending up at Coolangatta for brunch with a view. Did anyone say weekend plans are sorted? So while this one’s not technically a hidden gem, it is definitely well worth a visit for any Queensland resident. 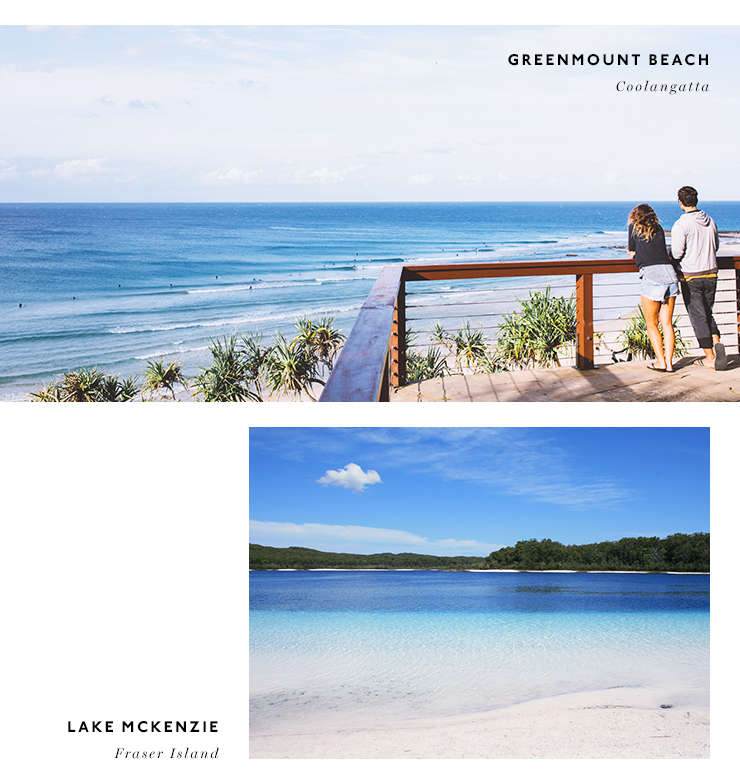 Lake McKenzie is what happens when you take a little bit of Whitehaven’s pure silica sand, a little bit of a pure rainwater lake so clear you can see the bottom and plonk it right down in the middle of the already beautiful Fraser Island. So in other words, it’s amazing. This is one you’ll definitely want to make sure your camera is charged for, guys. Need some travel inspiration closer to home? Check out these stunning spots you had no idea were near Brisbane.